I probably shouldn't say that like other US commodities (cars, houses, people), the Alabama Rig sure ain't subtle. Effectively it's a hardbody with multiple booms fanning out behind. On each of these positionable booms is fixed a traditional soft plastic bait (lure). The logic is the outfit mimics a shoal of baitfish - and predatory fish, like bass, love shoals of baitfish. It's not a pretty thing. Nor does it have finesse. Which makes its other name rather suitable - the Castable Umbrella Rig (CUR for short). Okay, granted. But is fishing up to 8 baits at once sporting? And does it have a place in tournament angling? 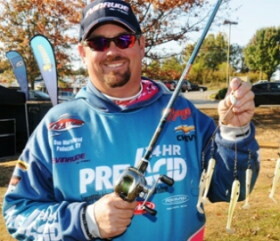 Unlike our competition angling over here, it would appear that in a number of state tournaments (not all), there aren't restrictions on the number of hooks that can be used simultaneously. Which begs the question, if it's a legitimate practice in winning (big) prize money, why hasn't anyone thought of this before? Dignity perhaps? Maybe the growing prize money or fame on offer in the US has made it easier to put pride to one side. There is a positive though. An economic one. Since the advent of Umbrella Rig popularity, a big demand as formed a brand new market for these lures. It would seem 'everyone' needs at least one of these new wonder lures. If that wasn't positive enough news for lure manufacturers and retailers, the real magic for the industry's economy is the very fact that where each angler fished a single lure and jighead before, they now need eight! And presumably they get through them at the same rate as a single set up. Ka-ching! It's easy to see how this has become the success story it has for the US tackle industry, but I can't help but feel it's not good for the sport - never mind the fish! Tell us what you think? Friend or foe? Would British anglers consider such a fish catching tool?